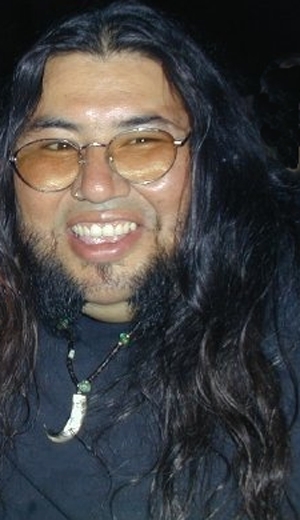 Julio Ybarra - Died 1-30-2015 - Bouncer at the legendary Black Bear Lounge in Madison in early 1990’s. 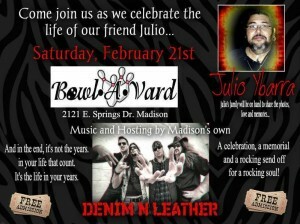 Side Note: Bowl-A-Vard Lanes will be a Memorial/Benefit for Julio featuring Madison band Denim & Leather. Free Admission. Matthew Cogley - Died 1-1-2015 (Rock) He was 30 years old - Guitarist and singer - Was a member of Failsafe. Little Jimmy Dickens (James Cecil Dickens) (aka Tater) - Died 1-2-2015 in Nashville, Tennessee, U.S. - Cardiac arrest (Country) Born 12-19-1920 in Bolt, West Virginia, U.S. - Singer and guitarist - (He did, “The Violet And The Rose” and “May The Bird Of Paradise Fly Up Your Nose”) - Was a member of The Country Boys - Country Music Hall Of Fame Inductee. Ted O’Connell - Died 1-3-2015 (Rock) He was 57 years old - Guitarist - Was a member of The Frank & Ted Show, The Soul Satellites and The Treble Makers (They did, “Caffeinated” and “Skulkin’”). Ray Gipson (Ramon Gipson) - Died 1-4-2015 in Danvers, Massachusetts, U.S. - Cancer (R&B - Soul) Born 9-24-1937 in Roberta, Georgia, U.S. - Singer - Was a member of The Bob-O-Links who became The G-Clefs (They did, “Ka-Ding Dong” and “Cause You’re Mine”), South Bound and The Ray Gipson Band. Lance Diamond (aka Love Doctor) - Died 1-4-2015 - Singer - Led The 24 Karat Diamond Band - Worked with The Goo Goo Dolls (“Down On The Corner” and “Never Take The Place Of Your Man”). Pino Daniele (Giuseppe Daniele) - Died 1-5-2015 in Rome, Italy - Heart attack (Blues - Jazz - Folk - Rock) Born 3-19-1955 in Naples, Italy - Singer, composer and guitarist - (He did, “Napule e” and “Quanno chiove”) - Worked with Eric Clapton, Pat Metheny, Mel Collins, Chick Corea, Wayne Shorter, Al Di Meola and Richie Havens. Curtis Lee - Died 1-8-2015 in Yuma, Arizona, U.S. - Cancer (Pop) Born 10-28-1939 in Yuma, Arizona, U.S. - Singer - (He did, “Pretty Little Angel Eyes” and “Under The Moon Of Love”). Andrae Crouch (Andrae Edward Crouch) - Father of modern gospel music - Died 1-8-2015 in Los Angeles, California, U.S. - After a a heart attack (Gospel) Born 7-1-1942 in San Francisco, California, U.S. - Singer and pianist - (He wrote, “It Won’t Be Long” and “Keep On Singing”) - Was a member of The Church Of God In Christ Singers, The Disciples and The Andrae Crouch Singers - Worked with Stevie Wonder, Elton John and Quincy Jones - Gospel Music Hall Of Fame Inductee. Tim Drummond (Timothy Lee Drummond) - Died 1-10-2015 - Born 4-20-1940 in Canton, Illinois, U.S. - Bassist - Worked with Conway Twitty, B.B. King, Bob Dylan, Crosby, Stills, & Nash, Eric Clapton, Joe Cocker, Neil Young, Ry Cooder, J. J. Cale, Albert Collins, James Brown, Lonnie Mack, Miles Davis, Joe Henry and Jewel. Clifford Adams - Died 1-12-2015 - Liver cancer (Funk - Disco - R&B) He was 62 years old - Trombonist - Worked with Kool And The Gang, The Stylistics, Patti Labelle, The Bluebells and Duke Ellington. A.J. Masters (Arthur John Masters) - Died 1-12-2015 near Nashville, Tennessee, U.S. - Prostate cancer (Country) Born 1950 in Walden, New York, U.S. - Singer and guitarist - (He did, “Back Home” and “I Don’t Mean Maybe”) - Worked with Charlie Rich - His songs have been recorded by Faith Hill, Steve Azar, The Oak Ridge Boys, Frazier River, John Berry and Jennifer Hanson. Dozy (Trevor Leonard Ward-Davies) - Died 1-13-2014 - Cancer (Rock) Born 11-27-1944 in Enford, Wiltshire, England - Bassist - Was a member of Dave Dee And The Bostons who became Dave Dee, Dozy, Beaky, Mick & Tich (They did, “Bend It!” and “Hold Tight!”). Ronnie Ronalde (Ronald Charles Waldron) - Died 1-13-2015 in London, England - Born 1923 in Islington, London, England - Singer, whistler, yodeller - (He did, “If I Were A Blackbird” and “In a Monastery Garden”). Kim Fowley (Kim Vincent Fowley) - Died 1-15-2015 in West Hollywood, California, U.S. - Bladder cancer (Rock) Born 7-21-1939 in Los Angeles, California, U.S. - Producer and singer - (He did, “Animal Man” and “Inner Space Discovery”) - Managed The Sleepwalkers and The Runaways - Produced The Murmaids, The Modern Lovers, The Germs and Flash Cadillac & The Continental Kids - Co-wrote songs for Helen Reddy, Leon Russell, Kiss, Alice Cooper and Kris Kristofferson. Ervin Drake (Ervin Maurice Druckman) - Died 1-15-2015 in Great Neck, New York, U.S. - Complications of bladder cancer - Born 4-3-1919 in Manhattan, New York, New York, U.S. - Songwriter - (He wrote, “It Was A Very Good Year” and “I Believe”) - His songs have been recorded by Duke Ellington, Billie Holiday, Diana Ross, Perry Como, Frankie Laine, Steve Lawrence, Barbra Streisand, Frank Sinatra and Elvis Presley - Songwriter’s Hall Of Fame Inductee. Jochen Hulder - Died 1-15-2015 - Cancer - He was 57 years old - He managed Die Toten Hosen. Paul Serrano - Died 1-15-2015 in Burbank, Ill., U.S. (Jazz) He was 82 years old - Trumpeter - Was a head recording engineer for Delmark Records - Worked with Aretha Franklin, Michael Jackson and Mick Jagger. Michael Gehrke - Died 1-16-2015 - He was 58 years old - Was a tour manager for The Scorpions for over 30 years. Yao Beina (aka Bella Yao) - Died 1-16-2015 in Shenzhen, Guangdong, China - Breast cancer (Pop - Folk) Born 9-26-1981 in Wuhan, Hubei, China - Sang and played piano and guitar - (She did, “Let It Go”). CJ Buscaglia (aka Jesus Quisp) - Died 1-16-2015 in Buffalo, NY, U.S. - After being taken off life support after cardiac arrest (Rock) He was 51 years old - Guitarist - Was a member of Green Jello later renamed Green Jelly (They did, “Three Little Pigs” and “Orange Krunch”) - Engineered recordings for The Goo Goo Dolls and Love & Rockets. Origa (Ol’ga Vital’evna Yakovleva) - Died 1-17-2015 in Kochenevo, Novosibirsk oblast, Russia - Lung cancer - Born 10-12-1970 in Novosibirsk, Russian Soviet Federative Socialist Republic, Soviet Union - Singer - (She did, “We Can Hear Your Pulse” and “Cradle, Cradle”). Ian Allen - Died 1-17-2015 in California, U.S. - Complications from heart valve surgery (Experimental Multimedia) He was 56 years old - Was a member of Negativland. Dallas Taylor (Dallas Woodrow Taylor Jr.) - Died 1 18-2015 in Los Angeles, California, U.S. (Rock) Born 4-7-1948 in Denver, Colorado, U.S. - Drummer - Worked with Clear Light, Crosby, Stills & Nash, Manassas and Van Morrison. John Bilezikjian (John Haig Bilezikjian) - Died 1-19-2015 - Kidney disease - Born 2-1-1941 in Los Angeles, CA, U.S. - Played the oud, guitar, drums, zither and lute and sang - Workd with Leonard Cohen, Little Richard, Robert Palmer, Brothers Of The Baladi, Luis Miguel and Placido Domingo - He can be heard on the soundtracks of, “Schindler’s List” and “The French Connection”. Edgar Froese (Edgar Willmar Froese) - Died 1-20-2015 in Vienna, Austria - Pulmonary embolism (Electronic Music) Born 6-6-1944 in Tilsit, East Prussia - Played keyboards, guitar, bass, harmonica and mellotron - (He duid, “Stuntman” and “A Dali-Esque Sleep Fuse”) - Was a member of The Ones (They did, “Lady Greengrass” and “Love Of Mine”) and Tangerine Dream (They did, “Sunrise In The Third System” and “Origin Of Supernatural Probabilities”) - He had been married to photographer, Monique Froese and artist and musician, Bianca Acquaye. Carlos Molnar - Died 1-20-2015 in Maracay, Venezuela - Stabbed by Canserbero (Reggae) Born 1980 - Bassist - Was a member of Zion TPL (They did, “Vitamina” and “Tus Recuerdos”). Canserbero (Tyrone Jose Gonzalez Oramas) (aka El Can) - Died 1-20-2015 in Maracay, Venezuela - Jumped from the tenth floor of a building (Rap) Born 3-11-1988 in Caracas, Venezuela - (He did, “Jeremías 17:5”). Rose Marie McCoy - Died 1-20-2015 in Urbana, Ill., U.S. (Jazz - R&B - Soul) Born 4-19-1922 in Oneida, Arkansas, U.S. - Singer and songwriter - (She did, “Dippin’ In My Business”) - Her songs have been recorded by Elvis Presley (“I Beg Of You”), Little Willie John, The Eagles, Faye Adams (“It Hurts Me To My Heart”), Aretha Franklin, Ike & Tina Turner (“It’s Gonna Work Out Fine”), Eddy Arnold, Nat King Cole, Little Esther, Lenny Welch, The Clovers, Ruth Brown and Big Maybelle (“Gabbin’ Blues”). Kemal Monteno - Died 1-21-2015 in Zagreb, Croatia - Pneumonia and sepsis (Pop - Folk) Born 9-17-1948 in Sarajevo - Singer - (He did, “Lidija” and “Sarajevo ljubavi moja”). Silvia Glauder (Su-Vaal Glauder) - Died 1-22-2015 in Vienna (Punk) Born 12-10-1956 in Vienna - Singer - Worked with Drahdiwaberl and Sextiger. Demis Roussos (Artemios Ventouris-Roussos) - Died 1-25-2015 in Athens, Greece (Prog - Pop - Folk) Born 6-15-1946 in Alexandria, Egypt - Singer and bassist - (He did, “We Shall Dance” and “Forever And Ever”) - Was a member of The Idols, We Five and Aphrodite’s Child (They did, “Rain And Tears” and “The Four Horsemen”) - Worked with Drafi Deutscher (“Young Love”). Neil Levang - Died 1-26-2015 in Canyon Country, California, U.S. - Born 1-3-1932 in Adams, North Dakota, U.S. - Played guitar, mandolin, violin and banjo - Worked with Foy Willing And The Riders Of The Purple Sage, Jimmy Wakely, Texas Jim Lewis And His Lonestar Cowboys, Frank Zappa, Bobbi Gentry, Glen Campbell, David Clayton Thomas, Elvis Presley, Bobby Darin, Neal Hefti, Neil Diamond, Dean Martin and Noel Boggs - Was a regular on TV’s, The Lawrence Welk Show. Margot Moir - Died 1-27-2015 - Complications from diabetes (Pop) Born 1959 in Scotland - Guitarist and singer - (She did, “Scarlet Skies” and “Tightrope”) - She was one of The Moir Sisters (They did, “Good Morning (How Are You? )” and “We Will Never Change”). Rod McKuen (Rodney Marvin McKuen) - Died 1-29-2015 in Beverly Hills, California, U.S. - Born 4-29-1933 in Oakland, California, U.S. - Poet, singer and songwriter - (He did, “The Mummy” with Bob McFadden) - Worked with Lionel Hampton - His songs have been recorded by Barbra Streisand, Glenn Yarbrough, Dusty Springfield, Petula Clark, Waylon Jennings, Al Hirt, The Kingston Trio, Chet Baker, Johnny Cash, Perry Como, Andy Williams, Pete Fountain, Percy Faith and Johnny Mathis. Maurizio Arcieri - Died 1-29-2015 in Varese, Italy (Pop - New Wave) Born 4-30-1942 in Milan, Italy - Sang and played synthesizer - (He did, “Ballerina” and “Scusa”) - Was a member of of The New Dada (They did, “L’Amore Vero” and “Cio Che Fai”) and was half of the duo Chrisma later renamed Krisma with his wife, Christina Moser (They did, “Many Kisses” and “Nothing To Do With The Dog”). Don Covay (Donald Randolph) - Died 1-30-2015 (R&B - Rock - Soul) Born 3-24-1938 in Orangeburg, South Carolina, U.S. - Singer and songwriter - (He did, “Pony Time” and “See Saw”) - Was a member of The Cherry Keys, The Rainbows (They did, “Shirley” and “Minnie”), The Soul Clan and Don Covay And The Goodtimers (They did, “Mercy Mercy”) - His songs have been recorded by Aretha Franklin (“Chain Of Fools”), Grant Green, Steppenwolf (“Sookie Sookie”), Gladys Knight & The Pips, Chubby Checker, Jerry Butler, Bobby Womack, Peter Wolf, Solomon Burke, The Rolling Stones, The Small Faces and Wilson Pickett (“I’m Gonna Cry”) - Worked with Little Richard and Jimi Hendrix.